This is an article I needed to read. After 16 years in a relationship which is ending I find myself pretty alone and empty and I'm only 29!!! I forgot what it was like to want and to need your "girls" around you. I just had this discussion with my sister on how the h*ll do people meet one another just on a friend level... Thank you! 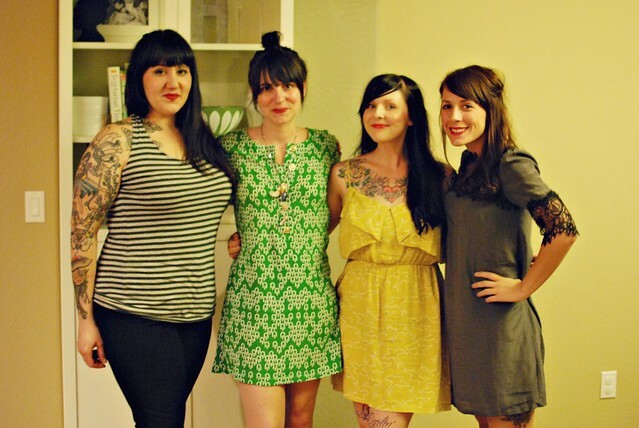 Making new girl friends as an adult is so tricky, especially for us introverts. So much emphasis seems to get placed on meeting a man to love...but, what about meeting a woman to hang out with!? Great post, thanks for sharing! Thank you for the great read! You have inspired me in many ways, including starting a blog. Come by and check it out! A couple years ago, one of my best friends and I had a falling out and haven't really recovered since. Most of my girlfriends live pretty far away, so I don't get much girl time during the week. And I definitely miss it. I think your advice about saying "Yes" is great. I definitely find myself saying no way too often, which is just inhibiting the possibility of meeting new friends. Maybe that should be my new years resolution.....say yes more often! Great post Danielle! I cannot wait for a little blogger lunch meet up in london that is on the cards for March. It'll be nice to finally really meet some of these ladies! loved this post! i need to get out there and meet new lady friends who will bring me healthy, fun friendships. last year i lost a best friend because she became too much drama and i find myself solo a lot more often now. i still have lovely girlfriends but they dont always have time with new babies, moving far away etc. ill try some of these tips! could you ladies be any cuter or more sylish!! Awesome dresses! Great post. Making friends as an adult is difficult. I'll try some of these tips & maybe branch out a little. Thank you. can never meet too many girlfriends!! Thanks for posting this! I've been wondering the same thing. How can adults make new friends? It's hard and... how do you keep the friendship alive? so true...but also as a mom i somehow lost the way to converse over something other then what the kids are up to... i dont even know what new music or tv show are out if its not yo gabba gabba or the clone wars cartoon. im a bore...need to make new friends :( will try ur advice...but how do i make internet friends?? i also have a family (big surprise) blog and would love to reach out to other twin mamas! Great post! You're right it can be incredibly difficult to make new friends as an adult. And then some how we are all so busy in our personal lives too that at some point you almost forget what you old friends look like! I second someone else's comment about how hard this is to do in a small country town. I wish for a book club or something to join, especially as I approach having my first baby, I know a lot of work 'friends' will naturally fall away. Online friends it is then! I loved the post, thanks for so much for sharing! I definitely try and keep in mind being more of a 'yes' person. It's so easy for me to be a 'no' person. Especially when it's so easy to stay home and cuddle up on the couch with the hubs. However, it is nice to get out with the girls once in awhile and get some space between myself and the man I love, it's good for us. Let us miss each other a little! You never know how much of a good time you'll have if you always say no! I also fall into the small town/limited options group. But all of these comments got me thinking... If we are all waiting for that hip book club or yoga group to come along, we'll never get anywhere. Someone has to be the first to start it up! I am going to try to summon the courage to start a group in my town for young women to meet and be social. If not me, then who?! Great post and tips :) I think it's always good to be yourself while making new friends, especially girls. I really appreciate this article. I shared it on my Facebook too, and all the ladies were going LIKE, LIKE, LIKE! Making new friends is definitely tricky - mostly awkward. But in the end, I think many people are flattered that someone is willing to put themselves out there in order to get to know them, and the awkward introductions fade away. I loved this post on Hello Giggles. I'm a recent college grad who will probably be moving out of state with my husband within the next year, so I'll be harnessing some of this advice soon most likely! Good post! It IS so much harder to make friends after college, but it's worth the extra effort! 4. Say Yes is definitely a good point. I often talk myself out of situations outside my comfort zone. I've lived in my new city for years without making many girl-friends... I'm definitely the homebody, knitty, non-partier, who listens to Marilyn Manson and abhors most pop-culture. (I'm much more fun than I sound!) The superficial girls in the dorms with their teeny-bopper bands and drunken-emotion fests weren't quite my crowd. BUT-- I did go with my friend to a rock- show. I almost said no. If I had, I would never have met my boyfriend- we've been together for a year! Best thing I ever said yes to! hahaha i love this. and i feel like i could totally learn from this. you know the movie "i love you man"? that's pretty much how i describe my life. i have one extremely close, pretty much a sister sort of friend that i've known for 17 years.. but we live in different cities now :( other than her, i feel like i'm always on the search for another friend that is closer! this is actually what got me interested in blogging to begin with!